Copyright READYFOR? All Rights Reserved. 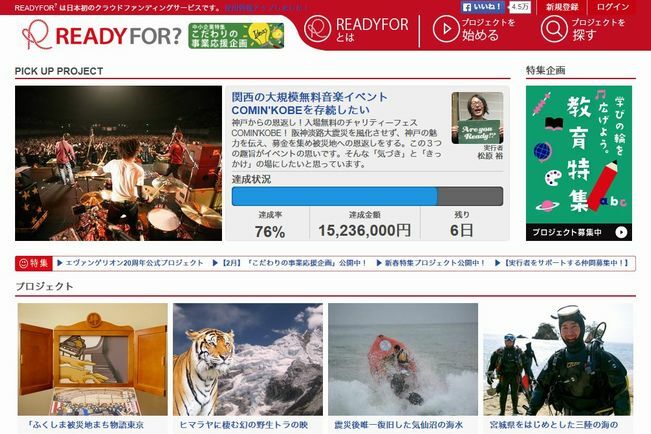 Awareness of crowdfunding in Japan, while still low, is gradually spreading. In this article we will introduce the current circumstances surrounding this new funding method in Japan, using excerpts from "2013 Review of Socially Responsible Investment in Japan" released on March 31, 2014, courtesy of the non-profit Japan Sustainable Investment Forum (JSIF). The spread of crowdfunding in Japan was triggered by the launch of the crowdfunding platform (moderating organization) READYFOR? in March 2012. According to the JSIF report, more than 50 confirmed Japanese-language platforms have been created to date. Crowdfunding can be classified into three primary types (donation, purchase, and investment) based on what supporters receive in return for providing funds. However, all of these types have one thing in common: the funds are provided by those who sympathize with the ideas or goals of the project initiators. Conventional online donation sites existed before the advent of crowdfunding. The number of donation-type crowdfunding websites in Japan has increased recently, reaching at least 15 sites. Furthermore, community foundations, which mediate donations and provide grants using funds received from citizens, have been established at locations across Japan. Some suggest that these foundations be included in the donation-type crowdfunding. Some of the major crowdfunding platforms fall into this category. Many purchase-type crowdfunding websites focus on specific areas of activity, such as craft making, community initiatives, social entrepreneurship, sports, and animation. One noteworthy development is that CyberAgent, Inc., a major Japanese developer of online entertainment, entered the crowdfunding market in August 2013. Such websites like this are increasing their appeal by finding potential projects that might receive a lot of social attention, such as journalism and filmmaking projects. In the future, this field will probably enter a competitive shakeout phase. The investment type has three sub-categories, namely association-, loan-, and equity-based crowdfunding. An example of the association-based crowdfunding is securite by Music Securities Inc. Some are of the view that all micro-investment funds should be included in the association-based type. In the loan-based crowdfunding category, three companies have been providing services, along with a new site that opened in December 2013 marking the first entry in the market by a securities firm. At present, there is no platform for equity-based crowdfunding in Japan, but it is expected that new platforms will start operation when regulations are relaxed in the future. Background factors contributing to the growing attention crowdfunding is receiving in Japan include: (1) the increasing use of social networking services (SNS) and other tools that make it easier for people to share their passions and collaborate, and (2) the lack of appropriate ways to raise funds for social projects or arts and crafts projects. According to a survey of smartphone users, however, only 13 percent of respondents were aware of crowdfunding, and only 4 percent had actually used a crowdfunding website. These data show that the popularity of crowdfunding still has a ways to go. Many platforms for donation- and purchase-type crowdfunding have been created thanks to loose regulations, but there is general concern over the risk of fraud. Investment-type crowdfunding, on the other hand, is strictly regulated. Platforms of this type are required to register as a Type I Financial Instruments Business Operator to deal in stocks, and as a Type II Financial Instruments Business Operator to deal in equity funds. In addition, loan mediation is practically impossible. These regulations discourage new entry into the market. To improve the situation, preparations are underway for the establishment of a crowdfunding council that will provide basic guidelines and manuals to ensure the safe and secure growth of the crowdfunding industry. In terms of policy, a working group of the Financial System Council examined ways to provide capital to new and growing (high-risk, high-return) companies, and proposed in its report to relax the regulations on investment-type crowdfunding.